NLL Awards: Who Should Take Home Major Awards? After the NLL championship final this week, we will see the league’s major awards announced. We gathered our NLL staff to give their thoughts on who should win each award and why. Not all awards are agreed upon and it is majority vote, so the actual winner isn’t actually the opinions held by every writer. Agnes Reis: Aaron Bold—Out of 18 games, Bold won 15 of them in their 16-2 season. He went 50-50 in the playoffs although he did lose the mini game as well (I’m sorry, I can’t consider that a game; it’s half a quarter). This was also the best season of Bold’s career with his lowest GAA (8.73) and highest save percentage in the regular season (7.91). He faltered slightly in the playoffs, but is a key reason the team had their best season to date. Pete Crowley: Garrett Billings—Even though he went down with a season ending injury he was the grinder, heart and soul of Toronto’s offense this season. Leading the league in scoring when he went down, and still having such great numbers to finish 3rd in the league when the season wrapped up. Di Miller: Cody Jamison—He led the league in points with 108 (36 G, 72 A); 8 PPG; 1 SHG; 140 SOG; and 70 LB. His dominance in both scoring and offense for the Knighthawks were one of the keys in getting them into the play-offs, and onto the NLL Championship Series. Jim Flannery: Shawn Evans—The defending MVP had another stellar season with the Calgary Roughnecks, finishing second in league scoring (105 points) and leading the league in assists (79). Among the top five scorers he also had the most loose balls (89) and three times as many forced turnovers (13) as the next best guy (John Grant Jr. with four). If Garrett Billings had made it through the full season, he was the obvious pick for me, but Evans takes it by a hair instead due to his stellar offensive play coupled with aggressive and effective back checking skills. Marisa Ingemi: Shawn Evans—Once again, Evans was a leader for his team and he has led them to a championship appearance. He was second in the league in scoring and was the top assist man in the league, making everyone on his team better. It’s tough not to vote for Garrett Billings but seeing the injury, Evans makes sense. Ian Neadle: Matt Vinc—The Knighthawks are back in the Champions Cup for a second year in a row and Vinc was a huge part of that. He stood solid in front of the cage and kept his team’s defense alive all season long. He may have had a poor game or two, but overall a very strong, consistent performer. Agnes Reis: Mike Poulin—Like Bold, Poulin helped backstop his team to the playoffs. His team was just slightly better on the scoring to help him out. While this hasn’t been the banner year for Poulin (yet), I wouldn’t take him out of the net for the final game. Pete Crowley: Aaron Bold—For holding both the league’s win and saves-against battle. Bold along with a great defense out in front was a huge part of Edmonton’s success and the team’s historic start to the season. Di Miller: Aaron Bold—His record of 15-2 as the Edmonton goalie was spectacular. He led the league in both wins and GAA. His stats showed just how strong he was not only in the goalie position, but also played a major role in defense: 705 SOG; 147 GA; 8.73 GAA; 558 saves; .791 save percentage; and four MVPs. This is the reason that I feel he deserves to be named atop both categories, goalie and defensive player of the year. James Flannery: Anthony Cosmo—If not for the goaltending of Anthony Cosmo, the Buffalo Bandits miss the playoffs in 2014. He played the most minutes of any goalie in the NLL this year (1063:36), broke Matt Vinc’s one-year-old record for saves in a season (752) and still finished third in goals against average (10.77) and second in save percentage (.797), just one one-hundredth behind Vinc. Marisa Ingemi: Anthony Cosmo—Since I covered the Boston Blazers in 2010, I was never an Anthony Cosmo believer. He has struggled to live up to his trade to Buffalo but he really stepped up this season breaking the record for saves in a season. I know there were two more games this year, but he played in front of an oft-injured defense and played very well. Agnes Reis: Dillon Ward—When Tye Belanger faltered at the beginning of the season, Ward was given an opportunity, and he ran with it. Throughout the season, Ward was regularly amongst the top five tenders in wins, winning seven of Colorado’s eight regular-season wins. He went 50-50 in wins and losses over the season and lost his first NLL playoff game, but as he wasn’t expected to be the Mammoth starter his first year out, that isn’t bad. Be finished the regular season with a .773 SV percentage, which puts him right in between Bold and Poulin, two of the top goalies this season. Pete Crowley: Garrett Thul—Garrett Thul for his outstanding rookie year. Giving spark to an otherwise stagnant team at times. The Wings needed some production out of someone other than Kevin Crowley who had a rather lackluster season. Thul and Buchanan gave the Wings the push they needed at times to stay out of the basement. Of all the rookies this season I feel he made the biggest impact on his team. Di Miller: Dillon Ward—He was fifth in wins with seven; and fourth in saves with 592. His stats were spectacular as a rookie goalie having taken over for veteran Tye Belanger only two games into the season: 766 SOG; 174 GA; 11.58 GAA; .773 save percentage; and 2 MVPs. Although he started out as a rookie this year, he most definitely played like a veteran, making key saves, keeping the Mammoth in many games, and getting them into the West Division Semifinals this year. Jim Flannery: Logan Schuss—After a slow start, the first pick overall in the 2013 draft had a pretty solid season, finishing his rookie campaign with the Minnesota Swarm with 73 points (16th best in the league) and 36 goals (sixth best in the NLL). He also collected an impressive 77 loose balls, showing himself to be a hard worker as well. He should have a very promising career ahead of him. Marisa Ingemi: Dillon Ward—I’ve always loved Dillon Ward as a guy who can succeed at box and field, and this year he proved he is a true NLL goalie. The Mammoth succeeded far better under him than Tye Belanger and he had a strong rookie campaign in a year full of good rookies. He is likely one of the most impactful players of this rookie class as he will be a rock in Colorado for years to come. Agnes Reis: Chris Corbeil—Corbeil had 27 points throughout 18 games, including five shorthanded goals. This has been his highest total to date, although he does show a knack for scoring with the man down. He was third on the team in loose balls as well as third in forcing turnovers. Corbeil contributed all over the turf, being a key cog in Edmonton’s defense. Pete Crowley: Chris Corbeil—Chris Corbeil had an amazing year for the Rush and their stellar defensive stand. Chris and the rest of the Rush defense gave a great performance and push to why defense wins championships in any sport. They fell short in the playoffs, but to a very talented rival team. The Rush have all the building blocks to be successful in the future behind players like Chris. Jim Flannery: Kyle Rubisch—Kyle Rubisch of the Edmonton Rush is a beast on defense and has already won this award two years in a row. Brodie Merrill was the only non-faceoff specialist ahead of Rubisch in loose balls this year (Merrill had 189; Rubisch collected 156). But Rubisch also broke his own league record for forced turnovers, taking a whopping 61, almost double the number of the next best player (Tyler Garrison with 36). Rubisch is the centrepiece of the best defensive unit in the NLL, absolutely dominating play in Edmonton’s end. Ian Neadle: Troy Cordingley—The Bandits may not have made it to the final rounds of postseason play, but Cordingley had multiple other successes. He brought energy and organization back to the team. 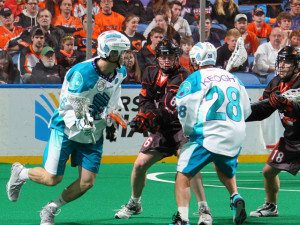 Buffalo made a strong, deep postseason run but fell short to the Knighthawks following a complete turnaround season. The Bandits are in a fantastic spot following the end of their 2014 run to work from for 2015. Agnes Reis: Troy Cordingley—After the Bandits failed to make the post season last year, Cordingley was brought in for new perspective. Under him, Buffalo went 8-10 on the year, which put them in third and playoff contention. Under Cordingley, the team began to improve on scoring and goals against decreased. Buffalo made it to the playoffs and the Eastern final, but lost to Rochester. For a team that faced a lot of changes over the last summer, Cordingley took them further than I expected. Pete Crowley: Mike Hasen—Mike Hasen at the helm has brought the Rochester Knighthawks back to the Champion’s Cup final. Can they pull off the three-peat? We will find out shortly, but to take any team no matter the roster to three appearances in the big show in any sport is very tough to do. Coach Hasen has proved that he is the man to do the job. Jim Flannery: Derek Keenan—There were a lot of question marks with the Edmonton Rush going into the 2014 season, especially with the announcement that forward Corey Small would miss the year with a knee injury and with veteran defender Jimmy Quinlan retiring. Instead of caving under the pressure, Keenan got his team out of the gate playing outstanding lacrosse, leading them to a record 14 straight wins to start the year. Although it didn’t translate into the team’s second Champion’s Cup trip in three years, the results Keenan got out of his young squad can’t be understated. Marisa Ingemi: Troy Cordingley—I am probably the biggest Cordingley fan in the NLL. He is a fantastic coach and despite the losing streak for the Bandits were able to bounce back somewhat in the playoffs with two wins. 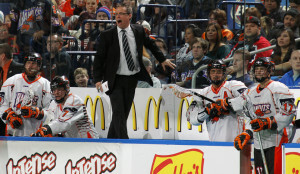 That team suffered injuries all season long and the 2013 NLL Coach of the Year proved he is still one of the best in the game. Ian Neadle: Steve Govett—They recognized big issues with their coaching staff and had the wherewithall to drop the entire staff midseason. They left team leadership up to their players and quickly found suitable replacements. 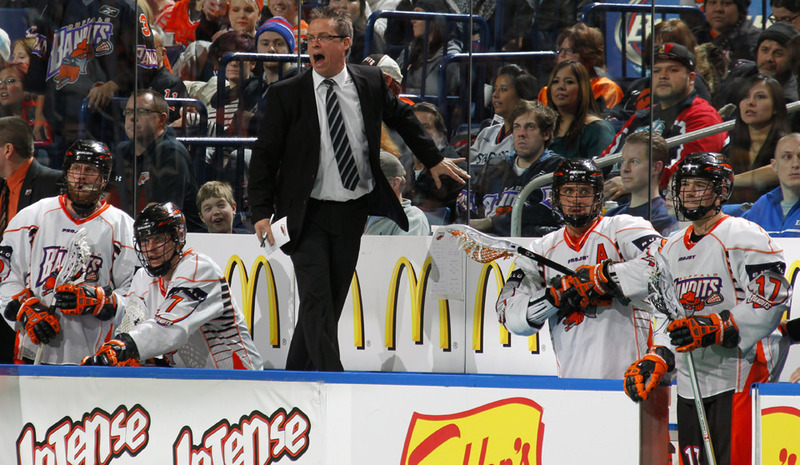 Upon reception of the new coaching staff, the Mammoth’s season turned around within a month. Quite respectable! Pete Crowley: Curt Styres—Curt Styres for his dedication to the Knighthawks organization, not only in his part as owner, but as GM. Curt has built a dynasty in his time as owner, making moves to bring in both big name players, and some under the radar. Curt’s love for the sport and family is seen all around the league at both home and away games. He is a true owner amongst the league and is one that will continue to push to make this league what it truly can and should be in the world of pro sports. Di Miller: Curt Styres—Styres made great decisions in acquisitions, the coaching staff, retaining veteran players and because of this his team is in the NLL Championship Series. James Flannery: Derek Keenan—Has any team had as much success in the draft over the last two seasons as the Edmonton Rush? Leading scorer Mark Matthews just completed his sophomore season and is already one of the best players in the NLL, Curtis Knight is also just a sophomore and might be as key a weapon in the Rush attack as Matthews, Robert Church scored 52 points in his rookie season. Add in key acquisitions like Jarrett Davis (53 PTS), Nik Bilic (67 LBs, 18 FTs) and goalie Aaron Bold (8.73 GAA) who came over in 2012 and Keenan has built what is starting to look like a true powerhouse.